Product #46519 | SKU CDS-610S/G0-C | 0.0 (no ratings yet) Thanks for your rating! 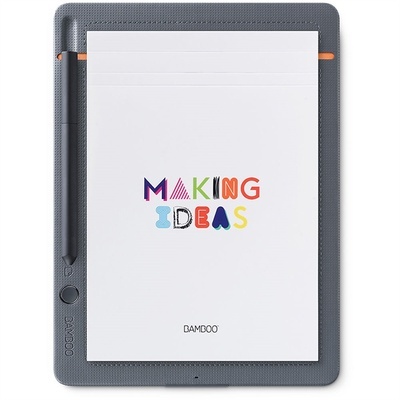 Bring your notes and drawings from paper to the digital world with the Bamboo Slate Smartpad from Wacom . This smartpad converts your handwritten notes and hand-drawn doodles into digital files at the push of a button. With a digital file, you can back it up on the Cloud as well as export it in multiple file formats. Combined with the Wacom Inkspace app, you'll be able to organise, edit, and share your creations on your Bluetooth-enabled iOS or Android device. If you're not near your mobile device, don't worry because the Slate can store up to one hundred pages and sync them later on.